Owachomo (oh-wah-choe-moo) Bridge is located within the Natural Bridges National Monument which is roughly 35 miles west of Blanding, Utah on Highway 95. There are 3 large natural bridges within the monument with Hopi names of Sipapu, Kochina and Owachomo. This post is for a loop hike that is made by hiking beneath Owachomo Bridge, down Armstrong Canyon to the Kochina Bridge Overlook, and then returning over the top of the mesa to the beginning of the hike. 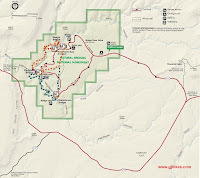 All 3 bridges in the monument can be visited in one big 12 mile loop hike beginning at Sipapu Bridge and hiking down White Canyon to Kochina Bridge and then up Armstrong Canyon to Owachomo Bridge and returning across the top of the mesa. That makes for a very long outing that wouldn't leave you with much time or energy to explore anything along the way. The alternative is to break the hiking up into 2 hikes of about 6.5 miles each with one hike being the Sipapu Bridge loop and the other Owachomo Bridge. Beginning at the Owachomo Bridge Overlook the trail drops down the cliff toward Armstrong Canyon. This part of the trail is well constructed with stone steps and hewn stretches of slickrock. Of the 3 trails leading down to the bridges in the monument this one is by far the easiest. Owachomo is a Hopi word meaning 'rock mound' which refers to a feature on top of the east side of the bridge. Not sure what makes the rock mound so significant but it makes for a cooler moniker than any of the previous known European names for the bridge. Once you reach the bridge the trail becomes no longer apparent until you continue hiking down the slickrock beneath the bridge where there is a trail sign to set you on your way. Across the canyon from this point you can see the remains of an old entrance road. The trail continues along a bench area above the canyon floor. The hiking through here is very easy with fairly even terrain and mostly solid footing. The trail does eventually drop down into the wash where the slickrock disappears beneath a good covering of sand and gravel which require more effort to be put forth. It is here though that you can watch for the animal tracks to discover what critters might be in the canyon. There are seasonal pools of water, that the park service asks you to leave for the wildlife to make use of, and thick vegetation consisting of cottonwood trees and several types of bushes. There are many places where the trail climbs back up to higher ground to get around obstacles in the stream bed. When there isn't any flowing water to contend with it is much easier to remain in the bottom rather than to be continually climbing up and down the side of the canyon. If you aren't sure whether the trail is leaving the stream bed to get around an obstacle a good trick is to look for tracks from other hikers. If there seem to be a lot of tracks that stay in the bottom and the stream is dry then that is probably the easier route. Also, the higher up the side of the hill the trail appears to be headed the bigger the obstacle it is probably trying to get around and the less of a chance that you will be able to stay in the stream bed. There are more ruins and petroglyphs that are noticeable when hiking from Owachomo toward Kochina than there are when hiking in the other direction. The prominent feature in this photo is called 'The Shoe' due to its resemblance from some angles of a wooden shoe. From the stream bed, when hiking in this direction, you will probably notice the 'Shoe Panel' of rock art up on the side of the cliff. There aren't any signs to point it out as there are no signs that point out any of the ruins in the monument. Even though when you do discover the ruins you may find that the park service has left an ammo box with a register and some handy information about the ruins (wink, wink). There is one particular ruin in the canyon that appears to be near 100% intact. The original wood for the roof can still be seen. Ruins like these make it worthwhile to bring along a telephoto lens or pair of binoculars. When flash floods come down a canyon they are like a tidal wave or big wall of water. In some of the canyons in Utah the water can come from a thunder storm many miles away and catch you off guard even when the weather doesn't seem threatening where you are hiking. The bigger the area a canyon drains the deadlier they can become. The debris in this picture is about 20 feet up on the cottonwood tree. If the wall of water that left the debris on this tree were to hit a narrow spot, such as a slot in the canyon, it could jump up to maybe 100 feet high. Floods like that tend to clean up canyons in some spots and make them impassable in others. They produce enough force to even move boulders around. The trail becomes less obvious where it reaches the canyon below the Kochina Bridge Overlook. Stay on the right side of the canyon and follow the slickrock until the boulders get in your way and then pick up the trail again just past them. The trail runs into the Kochina Bridge trail where it has descended about 2/3 of its way into the canyon. The Kochina Bridge trail has been expertly built with lots of handrails and hewn stones to make it easier for the many tourists. It is still about a half mile climb up out of the canyon but it is very nice and very pretty. Look for the big red Mesa Trails sign where you can pickup the trail again across the road from the restroom. From the Kochina Bridge parking area the trail climbs for right at 1 mile at a gentle pace to the junction where the Sipapu trailhead is to the left and Owachomo to the right. This junction is also the highest point of the hike. Although the trail from the junction to Owachomo trends downhill there is one section that drops down into a low spot where you have to regain almost exactly 100 feet of elevation to get back out of it. The only ladder on this hike is a very splintery little 4 rung'r that helps to get down a short section of cliff. I'm sorry, but while it is nice to have a ladder at this particular spot, this thing begs to be replaced with one made from raw juniper that is nice and smooth. It wouldn't be an awful thing to secure it with a couple of lag bolts either. 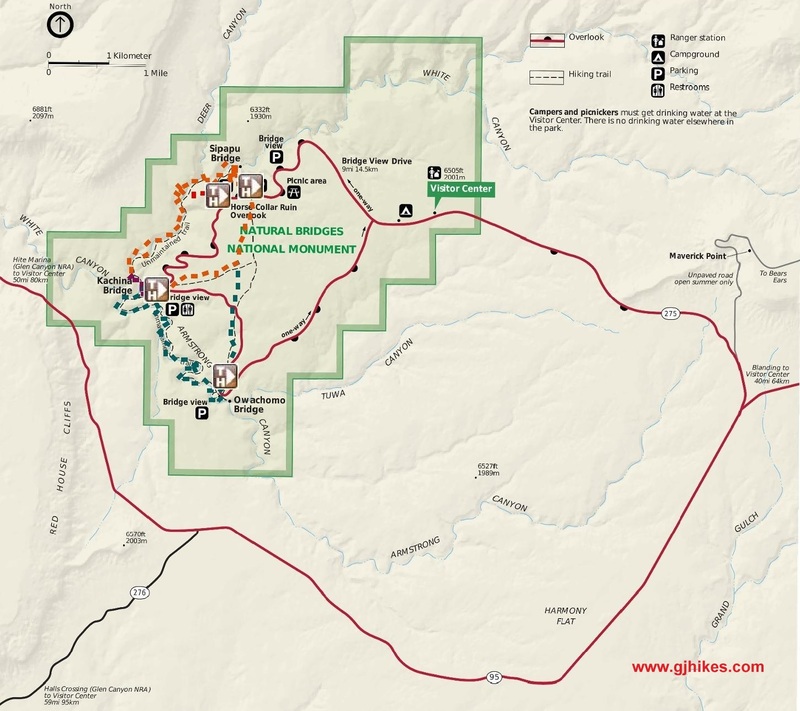 Of the 2 canyon hikes in Natural Bridges National Monument the Owachomo loop is probably quite a bit easier to hike than the Sipapu loop. There are fewer ladders and stairs on this hike but those are some of the things that make Sipapu so much fun. Even when there are lots of visitors in the monument most of them never venture beyond the overlooks. Of those that descend the trails to the bridges most of them climb back the way they came leaving very few people that actually hike the loops. These are the canyons of the ancients though so if you would like to see them for yourself then all you have to do is 'Take a hike'.